Labour pain is probably one of the most feared forms of pain and yet so many women at some point in their life span will experience the pain of labour – or part thereof. When we think of labour pain our first response is to consider how we may avoid it. Perhaps you’re sitting reading this article while the magazine is resting on your heavily pregnant abdomen. Reading these words instill a faint nausea or nervousness because you know it’s not long before your brain is going to start registering the fact that your uterus is painfully contracting to birth your baby. Take a deep breath and keep reading. I want to help challenge your mindset so that you can start anticipating your labour with less fear and more confidence. You may wonder who am I to challenge your mindset. Well apart from being a healthcare professional I have birthed two babies naturally (36hour and 21hour labours from start to finish) and twins by caesarean. I know the pain and your fear, but I also know that you can do it and that thinking rightly about what you’re about to go through will greatly impact on your ability to manage the pain. Pain is a protective mechanism that by design prevents us from destroying ourselves. When you touch a hot iron you’ve already removed your hand before you’ve felt how sore it is or developed a blister. During the 50’s Dr Paul Brand worked with leprosy patients in India. Some of the patients started losing fingers and toes without knowing how it happened. Eventually it was discovered that rats were gnawing at the appendages, but because the leprosy had damaged the sensory nervous system the patients didn’t feel the rats. Pain is given to withdraw from the cause, to know where to look for an injury or infection, or to place the new shoes back in the cupboard and wear your slippers until the blister from new shoes has healed. In our Western mindset, we’re quick to rush to the medicine cupboard for a painkiller before stopping to consider the cause. Perhaps the headache is caused by dehydration or a neck spasm that could do with some exercise or less time in front of the PC. Instead we try and annihilate the pain and seldom consider the cause. Emotional pain tells we’ve experienced loss or disappointment and when this pain doesn’t ease or become easier to cope with it’s an indication that we may need outside help to deal with our cause. And so, as you see pain is not our great enemy but rather a very valuable, indispensable tool. So how does this all relate to labour pain? If we didn’t experience labour pain, more babies would be born in the supermarket or shopping centres. Can you see the row of cubicles? Fitting room, fitting room, birthing room… What a relief that’s not the case! (To those moms who, have by the speed of their labour, birthed in a public space, we salute you). Labour pain most often gives a fairly good indication how far along you are in the birthing process (depending on intensity of contractions and how far apart they are). So, you know whether it’s okay to ‘dilly dally’ or make haste to the hospital. Labour pain is not continuous – it comes and goes. Like a wave in the sea, it washes over you and then gives you time before the next wave hits. I have experienced the pain of a tumour in my spinal cord, the continuous searing pain directly affecting the largest nerve pathway in the body. It does not come and go – it’s relentless, continuous, incessant, persistent and endless. What a relief, that labour pain comes in waves and isn’t this kind of pain. It gives us time to recover and some moms are even able to fall asleep before the next wave of pain hits. The intensity of the pain is also not the same throughout labour. It often starts off as a very manageable, even mild dull pain, and you’re able to continue your normal tasks for a while – perhaps even hours – before having to focus on each contraction when the intensity increases. How wonderful! I know that I’m in labour but I have time to finish off last minute tasks, take a shower and do that last-minute internet banking before I head off to the hospital. So here we have a pain that usually starts off with a low intensity (there are exceptions including induction of labour) for a number of hours AND it comes and goes. This is very different to a migraine or surgery pain, but it’s also different from injury or infection pain in that it leads to the climax of a baby in your arms. 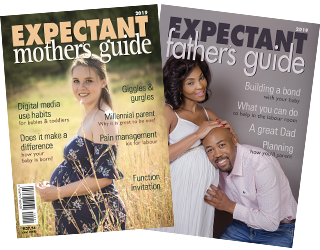 Like a Comrades Marathon Runner who endures intense pain for the sake of reaching the finish line and gaining a medal, we can be confident that every wave of pain is one less towards holding our precious bundle. Perhaps you’re not yet convinced that labour pain is a “different kind of pain” and worth thinking of differently? Have you ever considered the fact that as your labour progresses and your pain increases, your body prescribes and medicates you with Endorphins which are flushed into your system in increasing concentrations? Similar to intravenous Morphine, Endorphins attach to the same pain receptors in your body. They enable you to cope with the pain without harming your baby. Your body is fitted with its own ‘syringe pump’ which metres out this natural pain killer and is even blamed for making you ‘okay’ with going through childbirth again. No matter how your baby is born, you are going to experience pain. Either the most pain will be before your baby is born (in the case of a natural birth), or after the baby is born (if you have a caesarean). Having experienced both natural birth and a caesarean I found it far easier having the bulk of the pain before my baby was born and then being able to move around and use fairly mild pain killers after the birth making it easier to feed and care for my baby. The post caesarean pain and required medication after the procedure made it extremely difficult to feed and care for my twins. The pain medication made me so drowsy I hardly remember the first few hours after their birth. So, as you sit back, take another deep breath. Your own roll of labour pains will begin, but they will also end. As each wave hits, know that that wave too will subside and bring you one swell closer to holding your baby. Enjoy, in the intensity of pain, the high of your own Endorphin serum, salve and sedative that will help you reach the finish line and find pleasure in birthing your baby.